Dex Dangerous is in the Park campaigning for Mayor – click on him there to collect a prize box from him daily. He is promising to bump up our free daily SPREE rolls from 1 a day to 3 a day to help us make it to the SPREE Mall even faster. Arrogant, orange, bad hairdo, & running for public office? Not a political statement – just a joke! But the resemblance cannot be denied! Moms – LOL your above comment – so spot on!! Gave me a good chuckle for sure! Choco – Thanks again!! I just checked your wish list, and I have a Home for the Holidays wallpaper and flooring set that I can post to you! Check your mailbox! Gagagee – Aww darn! Your wishlist is empty! What am I supposed to do to repay your kindess? I got so excited when I saw the last comment thread about being able to move rooms that I immediately logged on only to struggle to find the “move room” button. Turns out that feature doesn’t come for a few weeks (in my excitement I failed to notice that until now lol)! Can’t wait to redecorate though!! 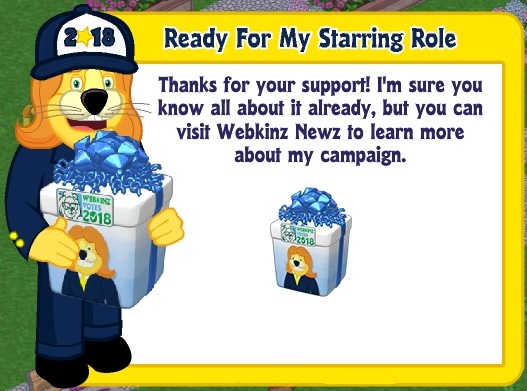 Anyone else have some plans on how they might restructure their webkinz room blueprint? I haven’t been going to the park to get the prizes from them. Don’t you need to turn ads on for them? I don’t like turning the ads on, they get kind of obnoxious. DEE – have you seen or tried the new Hershey’s kisses??? Hot Cocoa Kisses filled with Marshmallow Crème??? choco – do you use ghostery? moms… loved the comparison between the 2 “characters” ! 66Muffin… thanks for the items you sent ! My wishlist is presently empty because of all the people here who have sent the most amazing gifts !! dee. hope you were kidding about credit card… fell for that a few years ago..
not good… Learned a valuable lesson..
where did ya find them? You know, I was bummed when three spree rolls a day were taken away; but I don’t know that returning that perk would grab my vote. What would grab my vote is a promise to upgrade Kinzville Academy in some way (especially the strength class, which it appears I will never pass). Not a fan of the new oreo flavors. The cherry cola one was awful! No offense to anyone that likes it. I ended up throwing the package away. i merely report them, i do not buy them all……..but the caramel and lemon oreos were good………did anyone try the peppermint bark ones? hot cocoa flavor……..now that is a different story….. I might actually like the peanut butter ones. I don’t think of lemon going together with chocolate. Hmmm…peppermint bark oreos? That might be delicious! Any one else here like the Chick-Fil-A Peppermint milkshakes? I didn’t think I would like it, but I absolutely do! Ohhh! I should have known that about the lemon cookie! LOL! Funny about the peppermint milkshake at CFA. I like it because of the crunch! Ha ha! Ha ha! I’m sure! Ha ha! Puma – What a nightmare! I hope you get through the remodel quickly and are happy with the outcome. I can only imagine how stressful it must be to not have a kitchen, especially with a young child. We’re remodeling our house too. About a fourth of it is gutted. The contractors were supposed to be out today to start work on part of it, but we had an ice storm last night, and now it’s raining all day. So maybe they will come tomorrow. I will be so glad when it’s done! This ice storm made me so glad that we got the house for the little stray kitty. When I walked outside this morning, her cat house had icicles hanging from its shingled roof. She came out of the house briefly to say hi. She meows and purrs and rubs against my legs while I feed her. Then she goes right back inside her house and curls up on her heated mat. She stays dry and seems comfortable. She has a thick, shiny black coat. I still feel kinda bad for not taking her in, but she has really taken to her little house. She sleeps in it every night, and she’s always inside when it rains or is really cold. We also got her a heated food/water bowl because her food and water were freezing at night. Now they stay warm, which helps keep her body temperature warm too. She has really worked her way into our hearts. My husband, daughter and I all check on her multiple times a day. We’re all worried about her, but so far she seems to be doing great. I’m looking forward to Thanksgiving. I don’t eat meat, but my husband always cooks Thanksgiving dinner. He’ll make a turkey for my daughter and him. He makes all the other sides vegetarian. I never worry about having a vegan roast because I fill up on the sides. Mostly, I’m looking forward to having those few days off with my husband and daughter. The week after Thanksgiving, I’m going to start sending out resumes and seriously looking for a job. I would really like to have something lined up by the first of the year, but I will start sooner if I find something I like right away. So this could be the last holiday that I’m off for a while, depending on what type of position I end up taking. I have mixed feelings about going back to work full time. I’m not happy about it because I really love being able to just focus on my home and family. However, it will relieve a lot of financial stress and enable us to finish remodeling our house more quickly. We would really like to be able to put our house on the market within the next two years, and with as much work as it needs, that’s only going to happen if I’m working again. So I’m in the process of cleaning out as much clutter as possible and getting everything organized and tidy. Once the contractors are done with this portion of the remodel, I’m going to do a super cleaning so that this house is easier to keep up with once I’m back to work. I’ve already let my husband and daughter know that they will have to start helping out a lot more, so hopefully it won’t be too difficult a transition. Lots of changes on the horizon! I hope everyone is staying warm, dry, and well. Hugs to you all! kitty is lucky to have her little house and all of her special care from you! 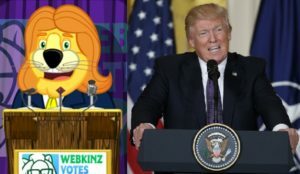 Momskinz found these replies to your comment on webkinznewz. Hi ~momskinz! I’m excited because I know a few of these! Here you go: Busy Artist Smock – pink polka dot boots, purple beanie, yellow raincoat; Neon Tutu – pink cowgirl boots, fall floral skirt, thick knit sweater; Pretty Plaid Gown – blue and green kilt, fall floral dress, ruffled sequin sandals; Sparkly Silver Suit Jacket – kinzville academy slacks, tiara, tuxedo jacket. I hope that helps a little. Happy crafting! Momskinz, I’d like to add ‘Cool Squares Shirt’ to your list. tmt – thanks for including those! i’ll update the page tomorrow – yay!!! Boper… nice to see you ! Hope school is going well …I am sure you will be happy for a break next week and a little more WW time ! RubyCube… Still struggling with work issues… Hope you are able to find the “perfect” job ! ( if there is such a thing)… at least one that will bring in an income yet one that you don’t dread going to each day … Keep us posted ! QOS… extra spree rolls are OK but I am looking for a Kinzville candidate who will take a stand to update all of the areas in WW that have given out the same prizes for so long…..( Prize claw…Magic Forest…Adventure Park.. and on and on !) Would also like Kinz World Rewards to be updated before they discontinue.) Bring back some of the rarer prizes so we can use up the rewards money….. We’ll see what the other candidates offer !! gaga – me too – i like new stuff! I typed out a response this morning and then we lost electricity for several hours! I’ll try to remember what I was saying… LOL! Gaga – I’d be fine with updated prizes! Btw, I don’t think I would vote for Dex. I don’t visit Spree often enough to keep up with it! Ruby – Your pet house for stray cat sounds great! As far as the going back to work issue…..my kids want me to work at the ER (now called ED) to keep up the “family tradition” of working there. There is an eleven year streak going that will end within a year and they are begging me to apply to keep it going. I haven’t been in the workforce for a long time other than my once a week teaching job that I love. I don’t make much which is the down side of what I presently do, but I feel comfortable where I’m at. Anyway, many of my friends are in the same boat of looking for next step now that kids are in college. It is a difficult place to be. looks like moms and puma and crazy and gwenda…….not sure who else we have thataway. oh my look at this…………..minus the cheese maybe and it makes way too much for turkey day here………..but in the future! i don’t think i’ve ever had that corn casserole with cheese, but it is yummy without it! does anyone have a good gluten free side dish recipe??? Hi all! The demolition in the living rooms is done- no carpet there, and blowers galore again! They should be gone by Sunday, and silence and peace will reign again. The visit with my mom was a good time- kiddo sure loves the heck out of his grandma- and we shopped for new floors and carpets. Still have a long way to go, but now that I can get back into the kitchen and cook for my family instead of eating out makes it MUCH easier. Food= LOVE! Bake sale items are SO SLOOOOWWWWWW… like, 8-10 minutes between them? Ouchie. I’d gotten used to popping on, doing dailies, and popping off, and having to sit and collect floaters is a but of a downer lately. Puma… Happy to hear that you and your Mom are having a nice but hectic visit ! gramma… watched nightly national news… ?? your area hit with unexpected snow fall …Too early for all of that ! !